The victory in the Dakar Rally, six-times winner of the World Cup and four-times winner of a place on the podium of the Dakar Rally. That one sentence is enough to show the most important sports achievements of Rafał Sonik and prove his position gained in the recent years. It doesn’t do justice to the countless hours spent training heavily, thousands of kilometres of driving through deserts and wilderness, as well as hectolitres of sweat. The best Polish quad rider specialising in cross-country rallies has always emphasized that he is first the entrepreneur. The entrepreneur that is lucky enough to fulfil his dream and represent his country under the white-red flag, winning in country after country on five continents. For a true sportsman like him, successes are not only a thing to be proud of, but first and foremost an impulse to break further barriers. He started as a skier, spending each and every free moment at Kasprowy Wierch, several days a week, commuting to and fro between Kraków and Zakopane. He also played tennis, table tennis and took up windsurfing. He also did some flying, which is still his great passion. He spent over 400 hours at the controls of small air planes. All this came to a halt when quads appeared in his life. As is often the case, it was all by accident. As he was on holiday in the south of France, at the beginning of the 1990s, he couldn’t windsurf because there was no wind, so he decided to take a ride on the ‘four-wheel motorcycles’ that appeared on the horizon, just to kill time. A few years later, in 2001, he established the ATV Polska Foundation, and remained his long-time president. In Poland, he won the national champion title six times in enduro and moto-cross. He was the most successful on the international arena. In 2009, as the first Pole in the 30 years of the Dakar Rally’s history, he made his way to the podium. He repeated his success in 2013, only to beat his previous achievement in 2014 by winning the ‘silver’ trophy. In order to gain new and valuable experience, he participated in the FIM World Cup series. In 2010, 2013, 2014, 2015 and 2016 he beat the competition and won the most valuable trophy, in 2012 he came up second. For him, off-road rallies are a school of life. Numerous injuries that are so frequent in such an extreme discipline are treated by him as a way to strength. When he almost lost his arm in an accident in 2006, following a few surgeries and arduous rehabilitation he got on a quad again. Even serious injuries sustained in the Dakar Rally in 2011 and Abu Dhabi Desert Challenge in 2012 did not stop him. He has 28 screws in his arm, but it doesn’t prevent him from winning with competitors that are half his age. 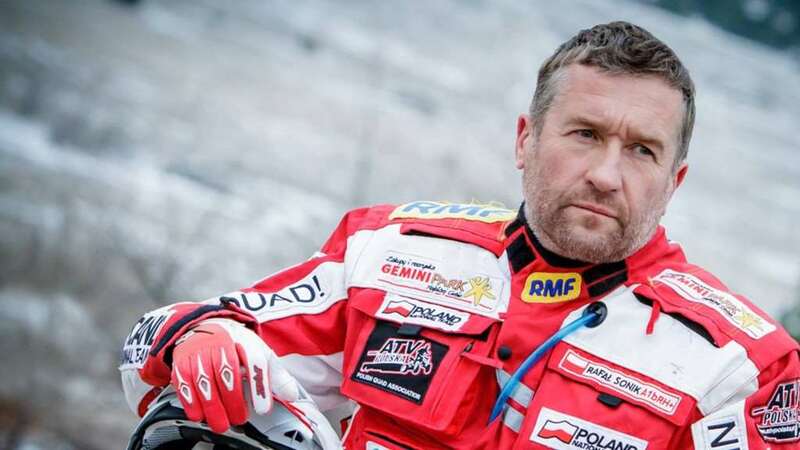 In 2012, together with Piotr Baupre, created Poland National Team – Poland’s representation in off-road rallies operating under the patronage of the Polish Automobile Association. In this way, we managed to integrate all participants of the Dakar Rally and show that even in such an individual sport, based on sponsoring team, cooperation and unity is possible. Sport successes mean responsibility. Rafał Sonik and the Ministry of Environment promotes the slogan: ‘Set the example, don’t quad the forest’. This slogan is intended on one hand to build awareness of environment protection among quad and motorcycle riders, and on the other hand – to signal to the local authorities that we need space where the fans of motor sports could go for a ride without obstacles. He also supports the ‘Fast on the track, safe on the road’ initiative. He is the ambassador of FIA Golden Rules programme for the best rally drivers in Poland. In this traffic safety campaign he promotes riding in a safety helmet.